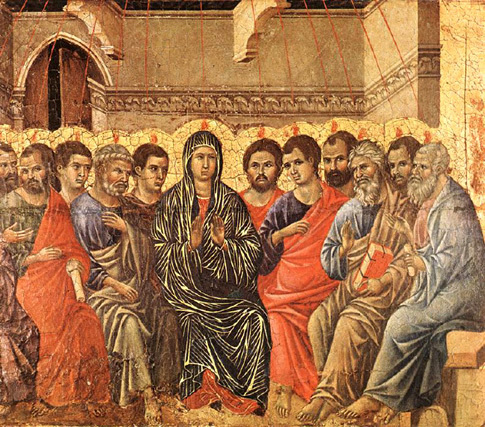 We are now in the final week of the Easter Season and are closing in on the great feast of Pentecost. For Pentecost Sunday the Church gives us an optional but actual Saturday Vigil Mass (as opposed to the anticipated Mass that is often mistakenly called a “vigil”) which has a striking similarity to the Easter Vigil that took place some 50 days before. Both of these scores correspond to the Lumen Christi Missal, the first installment of the Lumen Christi Series. I am very excited to announce to you next week our plans for the completion of this series! Is there a reason why the traditional Communion from Acts 2:2,4 (see Graduale Romanum) is not used during the Mass of the day here? The one given here is from the Roman Missal and it was meant to be said rather than sung. Ted, this project is a work in progress and not all antiphons are yet composed, including the one that you mention. The GIRM for the US, particular liturgical law, allows for the singing of the Missal antiphons, which is why this is included. Despite the profuse effort that we have all engaged in to educate musicians, clergy and the faithful alike for the past 5 or so years, the concept is still not understood, and people expect to see the Missal antiphons set to music. The Lumen Christi Series is trying to solve the problem by setting BOTH texts to music (except for the times when the Missal and Gradual correspond, which are many), offering a full compliment of sung texts to US parishes. I hope that this answer is clear. The Missal antiphons are meant to be sung in current liturgical law for the US, so I think that your statement above needs to be amended in the future in order to reflect this. Next PostNext Is PBC 2.0 Backwards Compatible?